This winter, prevent your vehicle's door handles, locks, and keyless entry pads from icing up simply by slapping these cool new Magnetic Door Mitts over them. 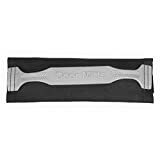 These strong magnetic fabric mitts are designed to fit over most vehicle door handles with doors made from metal. A much simpler solution than scrambling to find some de-icer to thaw out the locks when you're in a hurry. Door Mitt - Magnetic Auto Door Handle / Lock Protector.